So you want to be a Lagos Big Boy, so all the yellow girls can fall for you like the naira notes that rain from E-money’s money gun? Being a Lagos Big Boy is not easy o. You will need all the packaging you can get. Because we love you, we decided to put this guide together for you, so you can ball on a budget and trap all the yellow girls you want. Here’s what you’d need to pass for a Lagos Big Boy, and stop all the club bouncers from blocking you at the entrance. Either a Range Rover, G -Wagon or a Toyota Land cruiser will do. Don’t scream just yet, we know you can’t afford them. Find one of your rich uncles to ‘run errands’ for whenever you need the car to borrow pose. Alternatively, you can get the car keys to these cars and brandish them everywhere you go. 2. Live on the Island. By island, we mean, strictly Lekki, Ikoyi or Victoria Island. Forget places like Ajah, Badore, Epe etc. Those don’t count. You have two options: Become a caretaker for someone who has a big beautiful house on the Island, but lives abroad, or find friends to squat with. 3. Have an iPhone (the latest one) and a Samsung backup. If you’re serious about getting the ladies, you need the latest iPhone, and an equally expensive Samsung, so they know you mean business. 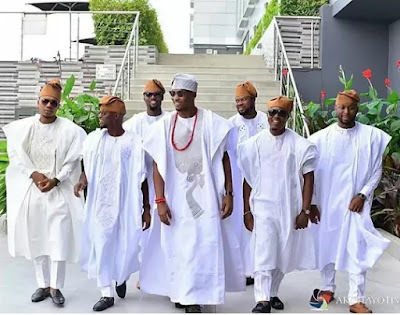 White read is the official uniform of the association of Lagos Big Boys. You need it to become a member and fit the description of a Lagos Big Boy: young and getting it big. Beg your tailor, cry if you need to and tell him/her not to disappoint you. 5. Pop bottles in the club. When you go clubbing, you have to pop bottles and buy drinks for your whole table. Yes, a table is a requirement too. How else will they know that you have arrived? It does not matter that you will have to stay back and wash plates in the club after, the ladies will definitely be impressed. 6. Get a killer haircut. The kind of haircut you have is a huge part of the Lagos Big Boy look. Forget your barber, and be ready to sacrifice like 3k for a haircut at any of the upscale barbing salons on the Island. Alternatively, you can ask TeeBillz who his barber is. 7. Become a member of ‘beardgang’. Having a full beard is very important o. That’s what will make all the girls rate you. Get nice shades, even if it’s fake nobody is going to know. Make sure you don it every time, especially with your white trad. 9. Get all the essential accessories. There are essential accessories that every Lagos Big Boy must have. A Gold watch, and a Gold chain. You need both. 10. Pretend like you know other Big Boys and stars. You need your act to be convincing. Name drop at every opportunity you get, save fake numbers on your phone with names like ‘Wizkid’ and ‘Davido’. Sometimes, pretend like you’re late to a lunch meeting with a very popular big boy. Just don’t overdo it, and always make sure you sound convincing. 11. Always have a wad of mint notes in your pocket. It’s all about the appearances. You don’t have to spend the notes, just bring them out at intervals. You should also try to add foreign currency to your stash. 12. Be a big talker. 13. Have more than one bank’s debit card in your wallet. Get a debit card from every bank possible, and arrange them neatly in your wallet. You need to show people that you hold multiple accounts in multiple banks so they can think you’re a baller. If you don’t have naturally pink lips, your best bet is to visit ‘under bridge’ Ikeja, you’d definitely find what you’re looking for. 15. Get designer casual wears. Make sure you have Polo by Ralph Lauren Tshirts, Gucci and Prada shoes, Louis Vuitton belts etc. If you can’t afford the real thing, the boys in Yaba will hook you up.